“IT’S A TIME for reappraisal,” is how Mick McCarthy put it as he prepared for his very first game as Republic of Ireland manager in March 1996. It was a transitional period, the embers of the Jack Charlton era still flickering but fading fast. With Brian Kerr’s kids still learning the trade, there was an in-between stage that saw the new boss juggling compromise. The young were too young. The old, on their day, still had some use. Added to the mix was McCarthy’s fondness for three at the back. And owing to injuries, there was a patched-up look to the squad that faced Russia at Lansdowne Road in a mid-week friendly. Everything was different but, still, largely the same. While a cherubic Shay Given was handed a debut, Alan Kernaghan, Terry Phelan, Paul McGrath, Andy Townsend, Niall Quinn, John Aldridge and Tommy Coyne were all still involved that night while Chris Morris, who hadn’t featured in an Ireland game since February 1993, was included in the group having impressed for top-flight Middlesbrough. Tony Cascarino – so often a bit player under Charlton – was there too and it said much that he would go on to become such a crucial part of the subsequent World Cup qualifying campaign. Two years previously, the sides had met in Dublin 4 on a dismal afternoon. With a relentless, swirling wind, the ridiculousness of the conditions was exemplified in the first-half when Phil Babb almost scored directly from a corner. The weather also rendered redundant the presence of genuine possession-first midfield thinkers like John Sheridan and Liam O’Brien, though the latter did smack the woodwork with a magnificent free-kick. Russia offered little that day and a few months later their World Cup adventure would be over after just two group games, Oleg Salenko’s memorable five-goal haul against Cameroon proving too little too late. Still, they had some immense individual talent. Playmaker Aleksandr Mostovoi was a gem and enjoying himself with Strasbourg when he arrived at Lansdowne in the spring of ’96. He had the run of the place and revelled in the space afforded to him. Alongside midfield partner Valery Karpin (with whom he’d win a Uefa Cup with Celta Vigo in 2000), sweeper Viktor Onopko, winger Andrei Kanchelskis and Igor Kolyvanov up front, they were a slick unit and easily picked the Irish apart. Mostovoi picked up a neat Kanchelskis back-heel that changed the point of attack, checked inside one challenge and then rifled home a terrific opener in the 37th minute. Inside ten minutes of the restart, Mostovoi deftly evaded Jeff Kenna after a short corner and laid off for Kolyvanov who arced a splendid strike across a rooted Given. McCarthy didn’t dwell too much on the 2-0 result, though the side would fail to score a single goal in their first three games under the new management. The lack of productivity up front was a real issue and cropped up at various intervals in the following 18 months, namely in scoreless home qualifiers against Iceland and Lithuania and during another Dublin draw with Romania. Well aware of his limited offensive options when taking on the job, McCarthy had picked up where Charlton left off and pursued Tottenham’s Chris Armstrong to try and bolster a fairly jaded attack prior to the Russia friendly. 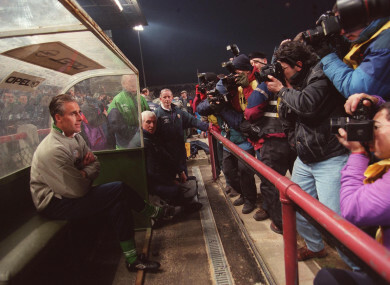 In early ’96, things looked pretty positive and McCarthy fancied his chances of bringing in a player he’d worked with at Millwall, despite the protests of Gerry Francis, who was managing Armstrong at Spurs. “I’ve heard some rumblings,” McCarthy said. But, by April, everything went quiet and McCarthy finally admitted nobody at the FAI could actually furnish proof of Armstrong’s eligibility. The player himself still retained some optimism and even managed to walk out at Lansdowne Road later that month, but it was for a promotional campaign for quick-thinking Harp’s new export beer. Armstrong coloured in a few more details in the story and admitted he was still keen on playing for Ireland, however much of a long-shot it was. The problem, according to him, was that he qualified through his father and the pair were not in contact anymore. “I haven’t seen my father in a few years so it’s an awkward situation for me, personally,” he said. Later in the year, the subject of Armstrong representing Ireland was still lingering but McCarthy confirmed that he’d given up hope of finding an Irish connection after an ‘exhaustive’ search. Francis also detailed a bizarre clause in the striker’s Tottenham contract that prohibited him from playing international football with anyone except England. The thinking behind it was to try and minimise the impact of Uefa’s ‘three foreigners’ rule should the team qualify for European competition. Those restrictions were removed after the Bosman ruling in 1995 but Armstrong’s contract wasn’t altered. Armstrong did eventually get an England call-up but it wasn’t until March 1999. Kevin Keegan included him in the squad for a Euro qualifier against Poland but he never got on the pitch. Before the Russian clash, McCarthy had scoured everywhere for new faces. He tried in vain to get Norwich striker Ashley Ward, Birmingham City’s Paul Devlin and defender John Pemberton, who was at Leeds. When Port Vale went on a decent FA Cup run, he enquired about their winger Jon McCarthy too, but he declared for Northern Ireland instead. “In the case of the other three, their great-grandparents were a little inconsiderate in that they didn’t fly back to Dublin to have their kids,” McCarthy joked. For a while, McCarthy tracked South African-born striker Sean Dundee and flew to Germany twice to watch him in action for Karlsruhe in the Bundesliga. “With a name like that, he’s got to have Irish connections, and our initial research indicates he could be qualified for us through grand-parentage,” McCarthy said at the time. But, though Dundee later confirmed some Irish lineage, it was clear he had ambitions to represent his adopted country and wished to wait on making a final decision in case Berti Vogts got in touch. Like Armstrong, that call never came and though Dundee wangled a £2m move to Liverpool in the summer of 1998, he made five substitute appearances, lasted one miserable season and was sent back to Germany by Gerard Houllier. After the loss to Russia, the result wasn’t the main story. It was Roy Keane, who lashed out at Omar Tedradze late on with a ridiculous lunge and picked up a straight red card. As he walked off, he threw the ball at his victim for good measure. It was all a bit hokey. But what made it worse was that he’d been handed the captain’s armband for the first time after Andy Townsend was forced off with an injury. McCarthy took the high road after the game. “It was a moment of silliness,” he said. Unsurprisingly, Keane was lambasted in the press, despite the fact that it was his first sending off for his country. ‘Roy’s Rashness Spoils Party’, was the headline in The Examiner. The narrative seemed to be that he’d ruined McCarthy’s evening, though the ease in which the Russians had picked the Irish apart probably left more of an impact. “I know it’s a Cork expression but Roy’s got to cop on to himself or else,” said Kevin Moran afterwards on RTE. At the end of the campaign, Keane would mis-step once more by deciding against playing at the US Cup. A stand-off ensued with McCarthy and he’d finish the year being booed at Lansdowne Road. The relationship would never recover. Email “Do you remember the first time? Mick McCarthy's big night, Roy's rage and a bizarre search for new players”. Feedback on “Do you remember the first time? Mick McCarthy's big night, Roy's rage and a bizarre search for new players”.